… works of fiction and documentary, Native Nomad Pictures work on filming events of interest. These are sometimes commissioned by the person/s, venue or event concerned, or simply due to the film-maker showing support for a subject believed in. In our previous update, we showed you our film “JKL”. This time around it’s more like HLK… for HyeLim Kim, Hye-Lim Kim or the most commonly known, ‘Hyelim Kim’. Within this film it explains a little about who Ms Hyelim Kim is, what she’s accomplished and where she is now. Frankly, there was more which could be said. You see, she’s performed at many places, with many faces and with many airs and graces. Recently, Hyelim worked with the BBC and the ever-so-popular artist, Ghostpoet. 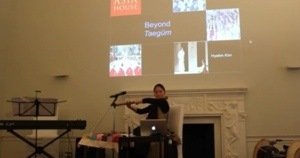 It’s worth noting too that as well as the various live versions of her tracks featured in this educational evening, Jason Verney’s film uses a collaborative tune from her album – “Nim” – in full, in which it’s displayed to full effect how her music really can go ‘beyond Taegŭm’. Director Jason Verney has allowed all to currently view it online, at the below destination. You’ll find a few other projects there also.